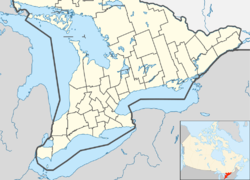 Scugog is a township in the Regional Municipality of Durham, south-central Ontario, Canada. It is northeast of Toronto and just north of Oshawa. Due to its location in the Greater Toronto Area, many residents commute to Toronto for work on a daily basis. The anchor and largest population base of the township is Port Perry. The township has a population of roughly 22,500. A smaller Scugog Township was also a historic municipality and geographic township prior to the amalgamation that formed the current municipality. The original township of Scugog used to be divided between Reach and Cartwright townships in Ontario County and Northumberland and Durham County, respectively. When Lake Scugog was created by a dam in Lindsay in 1834, flooding created an island known as Scugog Island. The island was separated from Reach and Cartwright to form Scugog Township in 1856. In 1872 George Currie built a grain elevator which is currently Canada's oldest grain elevator. The new township was part of Ontario County. According to Alan Rayburn's Place Names of Ontario, the name Scugog is derived from the Mississauga word sigaog, which means "waves leap over a canoe." This refers to the creation of Lake Scugog. Other sources indicate that it is a native word meaning swampy or marshy land. The creation of the Regional Municipality of Durham in 1974 resulted in municipal restructuring of the various townships in Ontario County. The current township of Scugog was created through the amalgamation of the original townships of Scugog, Reach and Cartwright and the town of Port Perry. The Township of Scugog is governed by a mayor, a regional councillor and five councillors elected on the basis of one per ward. Ward 1 includes Greenbank, Seagrave, Epsom, Utica, Manchester, Port Perry. Ward 2 is Prince Albert. Ward 3 includes the areas on Scugog Island. Ward 4 is Blackstock, Nestleton Station, Nestleton and Casesarea. Ward 5 encompasses the areas east of Port Perry and north of Prince Albert. The council holds regular meetings, open to the public at the town hall in Port Perry. Reserves # 34 consists of two tracts, east of Mississauga's Trail between Hood Drive and Pogue Road as well as west of Mississauga's Trail from Pogue Road to Seven Mile Island Road/Chandler Drive. Great Blue Heron Casino is located on the reserve. A Health and Resource Centre and Reserves Administration Office are located on Island Road. The largest private-sector employer in the area is the Great Blue Heron Casino, located on the Scugog First Nation on Scugog Island. Schneider Meats also has a facility in the Township. The Township is also a popular tourist destination due to the casino and recreational opportunities from Lake Scugog. Many residents also commute to other Durham Region communities and further afield by road. Lakeridge Health Port Perry site has a helipad for air ambulance use only. The 1973 TV movie, The Thanksgiving Treasure, starring Jason Robards, was partially filmed at the general store in Seagrave, and at a farm on Old Simcoe Road just to the west of Seagrave. Parts of the 1996 film Fly Away Home were filmed in Scugog. The downtown scenes from 2004's Welcome to Mooseport were shot in Port Perry. The downtown scenes from Hemlock Grove were shot in Port Perry. ^ a b "Mayor and Council". Township of Scugog. Retrieved 2018-12-13. ^ "Council Members". www.durham.ca. Retrieved December 13, 2018. ^ "Mayor and Council". www.scugog.ca. October 22, 2018. Retrieved December 13, 2018. ^ "Community Profiles from the 2006 Census". Statistics Canada – Census Subdivision. ^ "Aboriginal Peoples – Data table". Statistics Canada. ^ "The Thanksgiving Treasure (1973 TV Movie) Filming & Production". IMDB. Retrieved 24 November 2018. This page was last edited on 23 February 2019, at 22:48 (UTC).